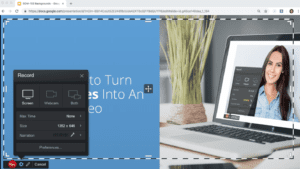 Saving your Google Slides presentations into video has a ton of benefits. Not only is it a great way to engage your audience but you can share your presentation with many online social services such as YouTube or Vimeo. With a video link, your audience can refer back to your presentation at any time. 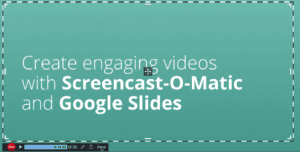 Users are turning to Screencast-O-Matic not only for their screen recording needs but to take advantage of several features to enhance their Google Slides presentations. You can use a webcam to include your physical presence on a video. Your face provides a personal touch to your presentations. 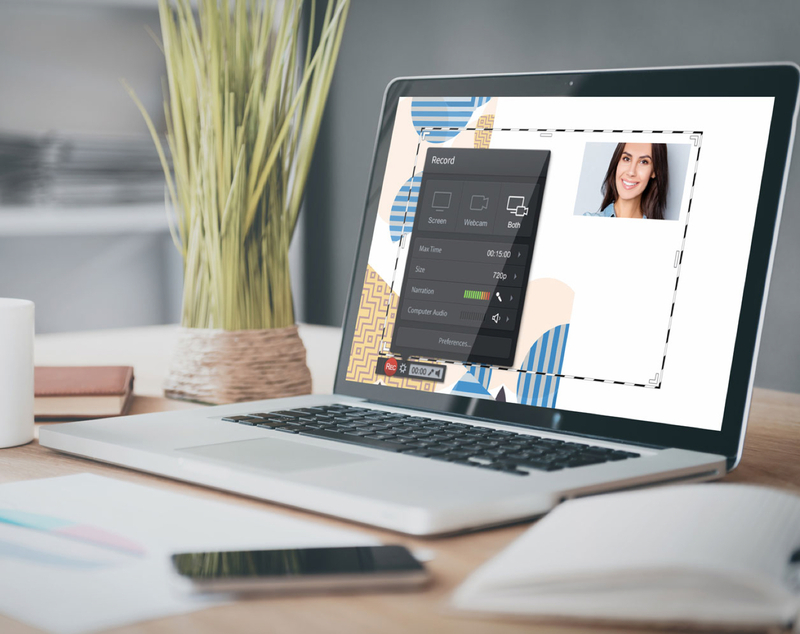 In addition, Screencast-O-Matic’s Green Screen feature enables you to remove the background of your webcam so that you can ’embed’ yourself into your video. 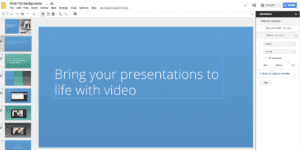 Before recording your video, make sure you prepare your presentation in Google Slides. You can be as simple as you want or add animations using your presentation’s software. You can always add transitions, animations, and overlays to your presentation after your recording. Choosing the right software to record your Google Slides presentation is essential. Using a recorder that’s easy-to-use and intuitive is a must if you’re looking to create quick videos. 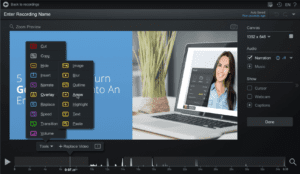 Screencast-O-Matic is an excellent option for those looking to create quick and simple videos to more elaborate ones. Head to the website and launch the screen recorder. If you have an account or have installed the app, you can quickly click on the Screencast-O-Matic icon to get started. Having an account with Screencast-O-Matic enables you to save your recordings into your recordings manager. You can access them any time you want so you can edit them or re-use them at a later date. Once you’re ready to record your Google Slides presentation, launch the recorder from the website or Screencast-O-Matic app. A dotted-black box will appear on your computer screen. You can drag and drop the sides of this box over your Google Slides presentation. A great tip is to put your Google Slides into presentation-mode before recording. This way you can get the best quality when you are recording. A control box has all the controls you need to start your recording. You can choose to record your ‘Screen,’ add a ‘Webcam’ or use ‘Both’ screen and webcam in your recording. ‘Max Time’ lets you know how much time you have for your recording. You can choose a preset ‘Size’ for your recording. There are three options for you to choose from 420p, 720p or Fullscreen. You can also drag and drop the sides of your recording. Recording at 720p will get you the best quality recording with Screencast-O-Matic. ‘Narration’ enables you to include your own voice. By clicking on the arrow, you’ll be able to pick a microphone. If you don’t want your narration included in your recording, you can check off ‘None’ to disable the audio source. Once you configure your box on the computer screen, click on ‘Rec’ to start recording your presentation. A ‘3,2,1’ countdown will appear. When you see ‘Go,’ you can start the presentation. Helpful tip: If you choose webcam, you can add the Green Screen filter in your recorder settings by clicking on the magic wand icon. You can also enable Green Screen in the video editor after you finish recording. When you are finished recording, click on the blue button. If you are satisfied with your recording, you can click ‘Done’ to save it. If you would like to start over and re-do your presentation, you can click on the trash ‘icon’ to re-record. By clicking on ‘Done,’ a screen with your recording will appear. You’ll notice options to save and publish your recording which we highlight in Step 5. You can choose to add effects including arrows and outlines to your recording. To do this, click on ‘Edit’ to continue (Must be on a Deluxe plan to use the video editor). Overlays: You can add images, blur out sensitive information, use an outline to emphasize certain points, add an arrow, provide additional text or zoom/ highlight into a specific area of your recording. Insert: You can insert previous recordings or add a video file. You can even add a new recording into your video. Transitions: There is a long list of transitions you can use in the video editor. Narrate: If you forgot something to say or want to redo your voice over a section of your recording, you can click on ‘Narrate’ to re-record your audio narration. Green Screen: If you used a webcam in your recording, you could remove the background with green screen. Check out ‘Green Screen features’ for more. When you are done enhancing your video, there are several options to save and publish your Google Slides video. 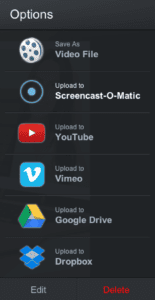 Connect your accounts with Screencast-O-Matic to access one-click publishing for future recordings. You can publish on YouTube, Screencast-O-Matic’s hosting services, or save as a video file. Deluxe members have more choices to upload and publish. With Deluxe, users can publish to Vimeo, Google Drive, and Dropbox. You also have the option to share your video link to social services like Facebook and Twitter. If you create presentations for school or work, adding video is easy. You can save time by creating just one video presentation. Send a video link to your audience so they can always refer back to it when needed. You don’t have to repeat yourself again! Now, how easy is that?